The warm, homey magic spun in the course of a Tom Rush performance has often been likened to a cozy evening spent in front of a living room fire. (We'd all be lucky to have such living rooms!) So pull up a chair and prepare yourself to be captivated by this preeminent singer-songwriter, whose expressive voice, distinctive guitar style, terrific yarn-spinning, and wry sense of humor have defined acoustic music for several generations of fans. Drawing on over four decades spent as a folk troubadour, Tom's performances roam a vast musical territory, from sweet ballads to gritty blues, offering a celebration of where acoustic music has come from and where it's going. 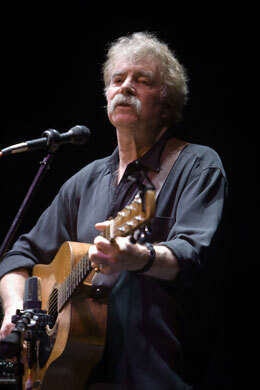 After beginning his musical career in Boston in the early 1960s, Tom established himself as one of the shaping forces of the acoustic music scene with his ground-breaking 1965 Elektra album, The Circle Game, which is credited by Rolling Stone magazine with ushering in the singer-songwriter era. Tom is still going strong today, continuing to write and perform classics like "No Regrets" and "River Song" and to champion up-and-coming folk musicians through his Club 47 concerts. His most recent album, What I Know, was voted Folk Album of the Year by the International Folk Alliance.